It's time for the Baker's Dozen Studio Challenge. This is a monthly opportunity for the Taylored Expressions team to share what makes our stamping studios hum. Each month we have a fun, crafty question so we can share our favorites, some tips and tricks, stamping advice and more. Actually, I've just developed my own idiosyncratic system over the years that works well enough for me. I'll give you a peek into my photography process. First of all, I always take my card/papercrafting photos with a white background. The reason for this is that I want the cards (or whatever) to be the star of the show, and to minimize distractions for the viewer. I also like the consistency of this, since I move the location of where I take my photos depending on what time of day it is. Pretty fancy, no? So much depends on a piece of poster board and a binder clip... This is a little adjustable medical table that I can roll around to where I need it. I've got a piece of white poster board that's propped up against an ink turnstile and held in place with a binder clip. Please note the dirty-pawed windows and the peanut gallery made up of my constant companions. This photo is taken in my family room/great room. The barstool is one of eight that surround the countertop bar that sections off the kitchen from the family room. I like to the barstools because they have a high back that I can binder clip the posterboard to and upholstered seats that I can stick quilting pins in to help keep the posterboard in place. I don't take my photos in direct sunlight as the glare is too harsh and causes shadowing on the photos. I believe the camera and lens I use make a big difference in the clarity of my photos. I use a Nikon D90 DSLR, and I take my card photos with a AF-S Nikkor 50mm F1.4 G lens that really bumps up the resolution. It's a great camera and lens, and was a Christmas gift from my husband in 2011. I also think photo editing is so, so important in showing off your paper crafting. I use a really unsophisticated photo editing software program: iPhoto, which comes standard on any Mac computer. I've bought various packages of PhotoShop, but have never taken the time to sit down and get familiar with it. It intimidates me! I've been using iPhoto for so many years (since at least 2002), that I know it well and it does most of what I need. I grab the photo and put it on my desktop. I rename it, then I go into iWatermark (a software you can purchase and download over the web for Macs) and add my watermark. iWatermark also resizes photos, and I generally resize my pictures to about 680 pixels and 72 dpi. It truly doesn't take a lot of fancy equipment to take good photos of cards! The biggest mistakes (in my opinion) that I see crafters making across the blogosphere and in galleries is that their pictures are too dark and that the photos on their blogs are too small. If your photos are dark, try to take them in natural light and/or start playing with the exposure levels in your photo editing software. 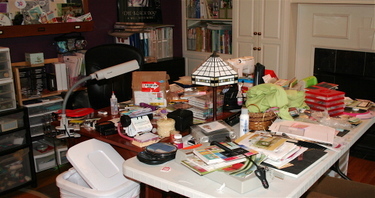 Never assume someone is going to click a photo on your blog to enlarge it and get a closer look -- people are lazy! (At least, I know I am -- there are too many blogs out there with big, clear photos for me to spend my time on blogs with poorly sized and/or lit photos.) I use Typepad to blog with and my photos are set to post at a width of 475 pixels (unless I change it). That's about as big as I can get them with the margins of my blog. If I could make them bigger, I would! A width of 500 pixels is probably ideal. If you use Blogger, or a blog service that has pre-set widths, bump that sucker up to 'large' or 'extra-large'! Don't make me squint or have to put my face closer to the screen to see what awesome stuff you've created! I think I've said all I can think of on this topic. Make sure you go visit my fellow Baker's Dozen team mates to learn how they make their photos look so good - I'm hoping I can pick up some hints and tips, too! 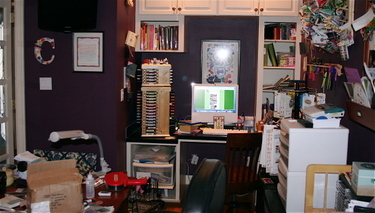 Please ignore dog nose prints on the window and all the clutter on the side of my cardstock file cabinet. It's one of the only magnetic surfaces in the house. Since we're looking at it, though, let me share with you a couple of funny magnets friends have given me over the years. Mind you, I have no idea what it is about me that inspired these gifts, but they make me giggle, I must admit. Farm animal butts from Cammie, artwork and poetry by Truman, circa 2003. A truism from my buddy Jen del Muro. Can't remember who gave me this one, but there are days when this rings so true. This one, I bought myself because it reminded me of Claremore. Hey - look at that cute, young gal in the photo. There I am, on a field trip to the Zoo, tying Truman's shoe. Look how young - 33 - and cute I was! (I'm sure I thought I was fat when it was taken, of course...) Now, I'm totally depressed - I am NOT aging well. Of course, I've had another kid and become a politician's wife since then, which, as Anne LaMott would say, is enough to make even Jesus want to drink gin from the cat bowl. Which brings me to the SECOND very important thing: to see for yourself just how badly I am aging, head on over to the There She Goes blog, where I'm hosting Stampbook Saturday. You will have a special place in heaven if you say I look good in the photo. I don't care if you have to lie to do so (just don't tell me you're that lying). Have a great Saturday, peeps! I know I mention my cardstock swatchbook all the time, to the point where you regular readers are probably thinking to yourself, "Enough about that dang swatchbook! If you love it so much, why don't you marry it1?" 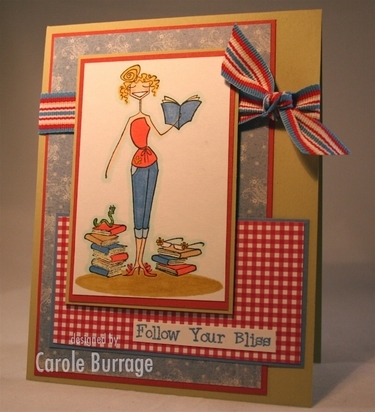 It's just that it's so so handy, and has really changed and streamlined my cardmaking. I can't tell you how much time I wasted, getting up from my desk, browsing through my cardstock filing cabinet for a shade to grab me, taking it back to my table, then comparing colors under the Ott light, only to have to get back up, return it to it's proper file, and start all over again. Now, I just grab my cardstock swatchbook at my desk, flip through it for a moment, pick the shade under my Ott light I want, then get up and get it. So much better! It got me thinking: maybe I should do the same thing for all of my inks? I don't know about you, but I have an OBSCENE number of inkpads, even though 95% of the time, I just use trusty old Momento Tuxedo Black. Still, when you want to use a colored ink, you want the right color when you need it, and without having to test a bunch of different shades on scratch paper. And maybe, if I could easily distinguish which color I needed, I'd be more apt to use those colored inks and feel better about all the money I spent on them and the space they take up in my craft room. Or maybe something from the orange family? For the cover, I took a scrap of glossy white cardstock and used a brayer to lay down a coat of Celebration Kaleidacolor ink. I mounted that on black cardstock covered chipboard, then made my title out of die cuts from TE's new Whimsey Alpha dies. 1. Maybe I will, once the kids are grown. Until then, I'm for sure keeping the old man. Lucky guy, isn't he? 2. I used the cheap stuff because there were an awful lot of cards to be trimmed down & punched. How many? I don't know & lost my place trying to count the other day. To tell you the truth, I'm a little embarrassed to know. I mean, why on earth do I have 39 varying shades of red/pink ink?! (I do know that number, because I counted it just now.) That's insane. And yet, I still want to try out those new shades from Hero Arts, and every Distress Ink that Tim Holtz comes up with, etc. It's sick, I tell you! 1. Unless I'm creating something for a particular type of challenge, my creative process inevitably starts with selecting an image. I have so many uninked stamps ready and waiting for a little attention, I inevitably drift towards those I've purchased but haven't had a chance to use. For example, for today's Studio Challenge, I couldn't wait to use the train image from TE's Life Is a Circus set; I think it's so fun & whimisical, and I know my 8-year-old train afficianado will get a kick out of it. 2. After selecting the image, my thoughts turn to what patterned paper I have that will coordinate best with the image. If possible, I try to pick a pattern collection that is current (in other words, in the paper company's most recent release), but if I think there is a pattern in my stash (in other words, older paper no longer carried in stores) that's too perfect for the image for me to resist, I'll opt for what I consider the better fit over what's trendy. Because the train image is so horizontal, I opted to go with the sketch on the left of my clipboard versus the one on the right (it looks like it will be harder to fit my image with the circle feature of the right sketch than it will be to elongate the one on the left). 4. Once I've got my stamp set, patterned paper and sketch figured out, then I start figuring out the rest of the card ingredients I'm thinking about using: cardstock (I am CONSTANTLY referring to the cardstock swatchbook I made last summer; it was a huge investment of time to make, but I can't emphasize enough how handy it's been), dies, embellishments, etc. These inevitably end up changing as I make the card and figure out what works and what doesn't. 5. Next, I set about coloring my image. Like my cardstock swatchbook, I keep my Copic or Spectrum Noir color guides close by when I'm stamping to select the markers I'm going to use. For this card, I ended up modifying this week's Deconstructed Sketch by turning it from vertical to horizontal because it fit the train image better. The baker's twine is supposed to resemble train tracks, and by laying the Small Scalloped Border die cut on top of the image panel, I was able to avoid creating some sort of grounding on the airbrushed sky background layer (score!). I used a strip of yellow chevron washi tape at the bottom, but backed it with white cardstock so you wouldn't see the patterned paper show through underneath it. If you look at the photo before my finished card, you'll see that I had originally planned to use white brads, but then thought better of it when I found the polka dotted red brads in my stash. As I create my cards, I always keep a list of the materials I use so I don't leave anything out when it's time to create my blog posts or various gallery posts. 7. I usually don't stamp or embellish the interior of my cards, but because I figure this will be a perfect one for a child's birthday (and I had the stamp set out in front of me), I thought I'd go ahead and stamp an interior sentiment. 9. Lastly, I file the card away into my card stash, because heaven knows if I leave it out, I'll spill something on it or mess it up some how. Reading has always been one of the great joys of my life. In fact, I am completely dependent on books; I have to have one with me at all times or I feel panicky. What if I get stuck in traffic or have to wait in line somewhere? I judge all purses by whether or not they're big enough to hold a book. And my house? We bought it from a woman in my book club. In 2007, I met one of my major goals in life by seeing my name on the spine of a book (Voices From the Heartland,a book I co-edited with friends, was published this past August). All of this is to give you an idea of how happy I am to have finally gotten my hands on Bookwormabella. I'm also awfully fond of Joseph Campbell, whose phrase "Follow Your Bliss" became a national mantra after he was the subject of the phenomenal "The Power of Myth" PBS broadcast with Bill Moyers. I have kind of a crush on J.C., even though he died before I graduated from high school. (Death doesn't stop me from having crushes on certain men; I also have a big one on Thomas Jefferson. I know, I'm weird...) I love that the My Favorite Things Sassy Sayings set includes this sentiment (even more proof that Kim V. is one smart chick), and think it's perfect paired with Bookwormabella. This card uses the sketch from today's SCS Sketch Challenge. Supplies Used -- Stamps: Bookwormabella by Stamping Bella, Sassy Sayings by MFT, A Muse oval; Paper: River Rock, Brocade Blue, Ruby Red, Georgia Pacific White, patterned paper by Daisy D's and Creative Memories; Ink: Brilliance Archival Graphite Black, River Rock, Brocade Blue; Accessories: Copic Sketch markers, ribbon, Dimensionals. Today's Featured Stamper is dlounds (aka Fat Cat Stamper, or Danielle). She may have a lot of names, but fortunately, she also has a lot of talent and a gallery full of sweet cards to CASE from. I chose this card, because I like the clean simplicity of it, and it gave me a chance to ink up the Time Well Spent set that SU! sent all active Demos as a holiday present (it's a level 3 hostess set in the new Spring-Summer 2008 SU! catalog). The terms of the FS challenge require changing at least two elements of the chosen card; I went with a different color scheme (I know you're shocked that I went with pink and green), and instead of an oversized brad, I used a cute little chipboard button from Making Memories as an embellishment.